Amber Lamont is dead ordinary. Well, she is ordinary. And she might very soon be dead. That’s what her parents have in mind for her anyway. They’re planning to kill her and eat her. It’s all about a deal they made with the Shining Demon, quite a long time ago. Power, strength and eternal life. All that could be theirs in exchange for a simple tribute of a jar of blood. The only problem is, the jar of blood must be spiced with the additional power that comes from eating their own offspring when they turn sixteen. And she was beautiful. Her skin, though red, was flawless. Her teeth – pointed now, and sharp like fangs – were white and straight. Her raised cheekbones changed everything. Only her eyes had stayed the same. She was glad about that. And of course, there were her horns. Black horns, like ribbed ebony, curling out from her forehead and sweeping back. Breathtaking to behold. It’s all a bit of a plus for Amber who is seriously ordinary to behold most of the time. 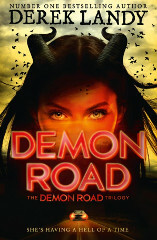 Anyway, Amber is being hunted, by six demons actually – her parents and their four friends, all in on the original deal. They aren’t going to stop until they find Amber and eat her. What else can they do? No good can possibly come of breaking their contract with the Shining Demon. Is there anyone on Amber’s side? Yes actually, and this is where the fun really starts. The enigmatic Milo agrees to help her. Her options are limited. Should she kill her parents before they kill her? Maybe she could summon the Shining Demon herself and make a new deal or at least compromise her parents’ deal...? Can’t promise you’ll sleep soundly in your bed. Can promise you’ll love the book!